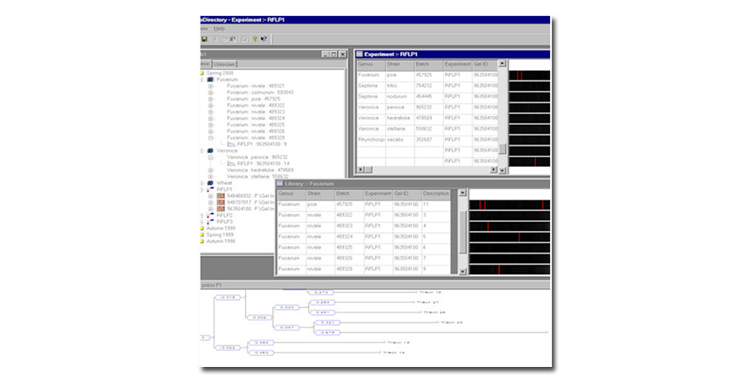 GeneDirectory software is ideal for large scale genomic fingerprinting studies, cluster analysis, VNTR analysis, RFLP analysis and genotyping. The software automatically compares thousands of bands on different gels. GeneDirectory is optional on all systems. Multiuser GeneDirectory can be set up for multiple users, with database and display preferences fully custom defined for each individual. Versatile comparison facilities Once classified it is possible to collate track data in libraries within the database. Comparison sets can also be constructed from tracks taken from any experiment, library or gel. Intuitive interface GeneDirectory displays the selected track data in a single window therefore the current analysis is always visible. Cluster analysis The software has the ability to perform cluster analysis on an unlimited number of tracks selected by the user. Using comparison sets for analysis is very useful when you need to compare results using different primers or restriction enzymes. It is possible to match by band matching or track profile. There are seven different dendrogram drawing methods including Neighbour Joining and UPGMA. It is possible to generate bootstrapping values for the matches between tracks, giving an estimation of the validity of matches. Searching (or identification) Search for unknown band patterns. Patterns can be identified by MW, Rf or position. Tracks can also be searched for by classification data (for example, strain number). Data sharing Any of the information within the database can be copied to disk, sent via a network or internet connection. Unlimited storage GeneDirectory has the potential for storing an infinite number of databases. Exporting All data can be exported to printed report, Word and Excel.